YT has been putting together a project plan for a good number of weeks now for a potential coworking space; very keen to have a space that is inclusive, which in general terms means a good open area with decent size tables and accessible toilets. As a starting situation, the biggest point of all is the open access to the community and the aim to build it organically. As a result, there’s been a list and wandering around Deptford high street, looking in on the new venues and seeing what the options are, especially as the high street is quite dead on a Monday and Tuesday; offices are being looked for, proposals have been started and delivered but will need to be sharpened as the formative/emergent elements of the group come together. The PPS project as it stands so far places learning, support and networking to engage and incubate local business front and centre as much as providing a space for local freelancers to have some quality work time in a salubrious environment facilitated by YT. All very grassroots and not corporate in the slightest – a reminder to you good reader that this is a business project with a social purpose, not a social enterprise. Its taken a good while as project work at Mycenae House has been a priority, and client visits seem also to be spiking lately. The term ‘coworking’ is a term disfigured by the late 90’s attitude to ‘coworkers’ as a dispassionate and generally unwelcome name for people you worked with…not all coworkers are colleagues, and this is conversely the case. In a modern coworking environment there should be a sensibility of space and the understanding of a field of expertise – not just in a skill set but in how to work with others. Social skills are the core of many modern careers; a career not being defined as a straight path of elevation, but ability to manage many different situations. ahem. Emotional content and emotional intelligence being juggled? Well, it makes a good strap line, makes you think that socialising and working with others is quite often the forgotten aspect of self employment and not to be dismissed lightly. As my mum used to repeat on many an occasion: ‘Its not what you know, its who you know‘. How right she was, try and prove that little aphorism wrong, as there is a whole strata of society built on who goes to which university. PPS is the name of the project – my own needs are part of this conundrum of self employment that many in the new digital economies face; the last thing to think of when writing that important message … away from the silence of coffee shops, out of the insular and insulated spaces and into (hopefully) focused work space where the possibility improves for thought provoking talks, a chance to meet another professional with a free or low cost answer, the chance to mix with other start up businesses all striving at different points on the journey to making a profit one day. All very worthy, what does soulchip get out of this? While things are building, this is my community work for the short term, and office space will be the goal to truly have a shared coworking space. The project starts out as a subscription model: first for snacks/food/admin and then will increase to pay for office space as well. 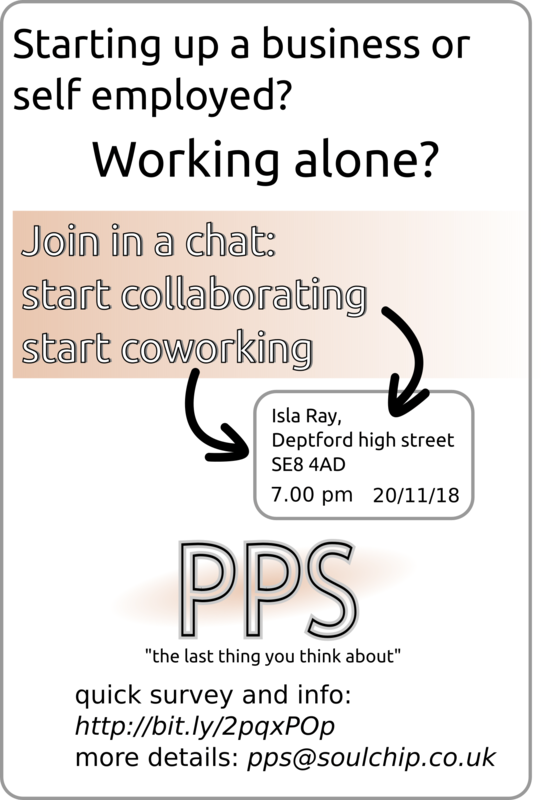 PPS also starts out as a ‘moveable feast’ as there is many changes in Deptford, there are spaces during the day to occupy and find which is most suitable on a consensual basis. This is a learning curve for YT as well y’know; the journey can be as useful as the destination, as long as we don’t get stuck in too many details. 1st draft of the ‘PPS manifesto of coworking’. Start with a common ground to share. If no common ground, then sharing is still useful. Just be honest, and it works out. Don’t be honest and it will be messy. This is all business, we are living in a locality that needs business too. Who benefits from a business with a social purpose? If none of the above, then what business do you have? Join in why don’t you. Fill out the simple Google survey to get started, get in touch if you’re interested and want to know more. You could do me a favour and register to come along.